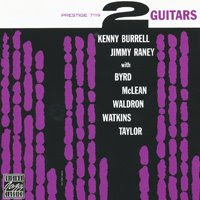 Kenneth Earl "Kenny" Burrell (born July 31, 1931) is an American jazz guitarist. His playing is grounded in bebop and blues; he has performed and recorded with a wide range of jazz musicians. Burrell was born in Detroit, Michigan to a musical family and began playing guitar at the age of 12. His influences as a guitar player include Charlie Christian, Django Reinhardt, and Wes Montgomery. While a student at Wayne State University, he made his debut recording as a member of Dizzy Gillespie's sextet in 1951. He toured with Oscar Peterson after graduating in 1955 and then moved to New York City in 1956. A consummate sideman, Burrell recorded with a wide range of prominent musicians, including: John Coltrane, Paul Chambers, Bill Evans, Gil Evans, Stan Getz, Benny Goodman, Wes Montgomery, Billie Holiday, Milt Jackson, Thad Jones, Quincy Jones, Melba Liston, Oscar Peterson, Jimmy Raney, Sonny Rollins, Jimmy Smith, Art Taylor, Stanley Turrentine, Jimmy Witherspoon and Cedar Walton. He also led his own groups since 1951 and recorded many well received albums, most notably Midnight Blue with Stanley Turrentine for Blue Note Records, which is considered a classic of 60s jazz now. Jimmy Raney (20 August 1927–10 May 1995) was an American jazz guitarist born in Louisville, Kentucky most notable for his work from 1951–1952 and 1962-1963 with Stan Getz and for his work from 1953–1954 with the Red Norvo trio, replacing Tal Farlow. In 1954 and 1955 he won the Down Beat critics poll for guitar. Raney has worked in a variety of jazz mediums, including cool jazz, bebop, post bop, hard bop and mainstream jazz. In 1946 he worked for a time as guitarist with the Max Miller Quartet at Elmer's in Chicago, his first paying gig. Raney also worked in the Artie Shaw Orchestra and collaborated with Woody Herman for nine months in 1948. He also collaborated and recorded with Buddy DeFranco, Al Haig and later on with Bob Brookmeyer. In 1967 alcoholism and other professional difficulties led him to leave New York City and return to his native Louisville. He resurfaced in the 1970s and also did work with his son Doug, who is also a guitarist. Raney suffered for thirty years from Meniere's Disease, a degenerative condition that eventually led to near complete deafness in both ears. Fortunately, his playing remained unaffected. Raney died of heart failure,in Louisville Ky. on May 10th of 1995, just short of his 68th birthday. An obituary in the New York Times referred to Jimmy Raney as 'one of the most gifted and influential postwar jazz guitarists in the world .